The popular Dodge Durango is a mid-size SUV with a choice of appearance packages to suit your style. Are you bold and sporty? Check out the Brass Monkey appearance package. Is your style more sleek and sophisticated? The Anodized Platinum package was made for you. The Durango Brass Monkey package features 20-inch bronze wheels. It also has exterior badges and a crosshair grille in gloss black for a sharp finish. 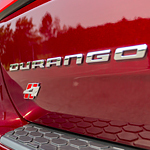 If you choose the Anodized Platinum package, your Durango will come with 20-inch satin carbon aluminum wheels. The grille and door handles are platinum in color, and the interior features silver stitching and gunmetal accents. For an extra touch of luxury, the seats are trimmed with leather. Whether you’re bold as brass or cool as platinum, stop by Porterville Chrysler Jeep Dodge Ram and test drive the Dodge Durango. Haul your friends, your family or your gear without compromising your personal style.